Luna Park Melbourne Australia, epic fun! 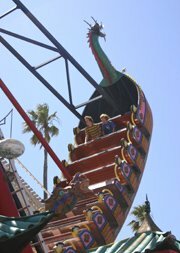 Luna Park Melbourne has great rides and experiences for families, although perhaps not for serious thrill seekers. 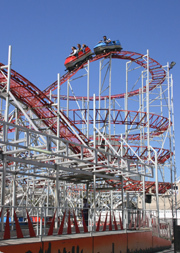 It has charm and is nearly 100 years, old with the original restored roller coaster still operating. The big face at the front is an icon and worth the visit. Part of its attraction is its great location in the lively and picturesque St Kilda, on the shore of the famous sandy St Kilda Beach  one of the Melbourne places of interest. It opened in December 1912 and immediately started to draw in crowds. The main attraction back then was the live entertainment that changed frequently. House bands would play lively music, trapeze artists swung from wires, animals performed and acrobats jumped around. These acts dont continue to run, but the park now boasts 17 rides for every age and type. If youre a bit of a thrill seeker, you have a choice of 7 rides. I must say the roller coasters, dodgem cars, the Shock Drop are my favourites. I dont think anyone can get sick of roller coasters! If youre a bit more of a quiet rider, the Carousel, Ferris wheel and Scenic Railway would suit you better! If you are travelling with younger kids (which is most likely), there are a number of mild rides fit for kids around the age of 5. The Carnival games stalls are a sure hit for the family. The classic put the ball in the clown s mouths games are very popular along with the other few games. Even if youre not a first-prize winner, everyone is a winner at Luna Park Melbourne as you receive a consolation prize. When you start getting tired and hungry and just want somewhere to relax, Melbourne Luna Park has all the classic carnival foods from Fairy Floss to Hot Dogs plus healthier alternatives! However, only two minutes away in Acland Street you can get any style of café food and Continental cakes, which may be an attractive option. Be sure to check out the different seasonal attractions that the cosy theme park has to offer. Recently in our winter, Luna Park Melbourne put on the Winter Wonderland show where they created 10 tones of snow for youngsters and adults to have fun. It is a good idea to get an unlimited pass, if you want to do more than a few rides. You dont actually have to pay to get in  you just pay for the rides. That means that you can get a pass for the kids and just hang around to watch them. 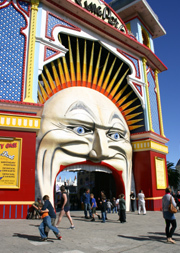 To get to Luna Park, just take the 96 tram from Bourke Street and get off at the huge mouth, you wont miss it! Luna Park Melbourne is renowned for its quirkiness and good times for the whole family  even the youngsters and oldies.